Have you heard? The Sutro Library has a new Genealogy Librarian, Dvorah Lewis! She started work on June 5th and has already had positive feedback from a patron after she handled a complex question regarding Virginia tax lists. Her passion for the archives and genealogy began while she completed her Humanities Honors’ thesis, using this project as a way to explore her family history. After researching for two years, she transformed the few sentences she had based on cloudy memories into a novella supported by archival materials. An interview with her great Aunt Essie, the eldest member of her family at the time, revealed the heart of the project: a Jewish orphanage where Essie and her siblings grew up in during the 1930s – 1940s. This also happens to be America’s first Jewish orphanage located in Philadelphia. She often encourages others to talk with the elder members of their families and research in a local archive—so many treasures are there to be discovered! Dvorah feels that by preserving the past, we can understand the present, and bring positive change to the future. This sentiment follows her in every aspect of her life. Go and visit Dvorah Lewis at the Sutro Library, part of the California State Library. It’s located on the fifth and sixth floor of the J. Paul Leonard Library on the campus of San Francisco State University. Originally hailing from Davis, Dvorah went to Southern California to pursue her interest in creative writing. She earned her Bachelor’s in English with a minor in Jewish Studies and an emphasis in Creative Writing at UC Irvine—zot, zot! Dvorah returned to Northern California with her Master’s in Library Science (MLIS) from UCLA. 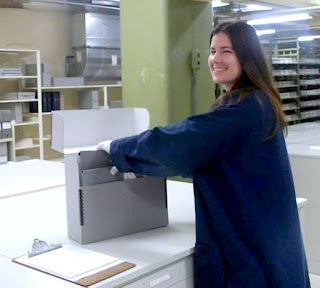 While completing her graduate degree, she worked as a Reference Assistant at the Charles E. Young Research Library. For the past year, she worked as a Project Archivist for two Los Angeles Jewish institutions. She comes from a long line of state workers: her dad was a Correctional Officer (recently retired); her brother works for the Department of Finance; and her twin sister works in the Department of Pesticide Regulation. She is especially excited to be closer to her twin sister who is getting married in a few months! In her spare time, she continues to write and recently completed the last installment of her fantasy/sci-fi trilogy. After putting her genealogy journey on hold, she’s ready to delve back in, expand her family tree, and hone in on her genealogy research skills.